It’s hard to imagine now just how deeply Walt Disney Animation was in the doldrums in the years before The Little Mermaid was released in 1989. Since 1967’s classic The Jungle Book, the studio had only released eight animations and they were largely of dubious quality and most met with limited success (leading up to this film were The Fox and the Hound, The Black Cauldron, The Great Mouse Detective and Oliver and Company – not films anywhere other than the bottom of most people’s Disney rankings, though the latter of them was implausibly successful). Incredibly, they hadn’t released an animated fairytale since 1959’s Sleeping Beauty – the company giving the impression of having forgotten what led to its great success in the first place. But of course, all that changed when Hans Christian Anderson’s classic tale made its way to the big screen – audiences flocked to see it and it sparked the revival of the whole company, which had been propped up by its theme parks for many years. It is no exaggeration to suggest that music helped propel the film’s success far more than usual. 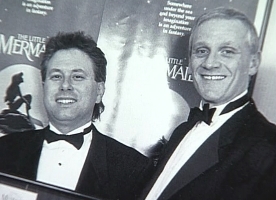 Lyricist Howard Ashman helped frame the whole story and received co-writer credit; he insisted that the songs be used to propel the narrative and not just be isolated showpieces as had become the norm; and he brought on board his writing partner Alan Menken, beginning the composer’s long association with Disney (something that I’m sure would also have been true of Ashman had he not tragically died in 1991 as a result of AIDS, with which he was diagnosed while working on this film). The songs – well, they’re brilliant. Things start off with “Fathoms Below”, which immediately sets the tone of the film – it’s sweet and good-natured, an old fashioned sea shanty. “Daughters of Triton” is a lighthearted ditty for a chorus, a delightful little song. The most comedic of the songs is “Les Poissons”, a funny song performed by René Auberjonois hamming it up as a French chef. The big ballad is the outstanding “Part of Your World”, as Ariel pines for life on dry land. Ashman’s clever lyrics and Menken’s soaring melody combine in perfect fashion, lightning in a bottle, one of the great Disney songs. And the big villain song – Ursula’s “Poor Unfortunate Souls”, sung with gusto by Pat Carroll – is great too, delightfully macabre and yet eminently singable in the shower – there’s a real touch of Kurt Weill about it. There are two wonderful calypso songs here for Sebastian the crab. “Under the Sea” is the other of the film’s two genuine classic songs – funny, insanely catchy and memorable, brilliantly sung by Samuel E. Wright. Darling it’s better down where it’s wetter – take it from me. It was the one of the three Oscar nominated songs from this film that won the award itself and frankly it’s so brilliant they should have given it three. Then there’s “Kiss the Girl”, full of Caribbean rhythm and a cheeky romantic spirit. As for the underscore – it was the first that Menken had ever written. He relates in the liner notes that he was unsure about doing it but proceeded at Ashman’s prompting – the latter keen to ensure the film had complete musical continuity – and successfully “auditioned” an action cue for the filmmakers. It does sound a bit “raw” I have to say – and maybe its Oscar win not quite as deserved as that for the song – but it’s beautifully judged and the decision to let Menken do it was entirely right (and as the years and the projects went by, his dramatic underscoring just got better and better). The main title alone – with its uplifting orchestral and wordless choral arrangement of “Part of Your World” – immediately provides an example of that musical continuity Ashman wanted. By design, and entirely understandably, some of the score is somewhat Mickey Mousey, but what’s surprising is that it is all done in a naturally musical way – it’s not bitty or overly chaotic. I love the grand gestures it contains – the exaggerated doom in the darker moments, the totally innocent joy of the lighter ones. One of my favourites is “Fireworks”, a joyous set-piece full of life and laughter; and that’s followed by the pick of the action cues, “The Storm”, exciting and most entertaining. This album – part of Disney’s deluxe “Legacy Collection”, giving the blue riband treatment to a series of classic scores from their archives – is beautifully put together almost in its entirety. There are lengthy liner notes – including a lovely, extended note from Menken – and beautiful concept drawings in the booklet. There’s a whole bonus disc of demos (both songs and score) performed by Menken and Ashman. But I did say “almost” – one thing that always seemed curious about the original album is the small, somewhat tinny sound of the orchestra in the underscore and while it doesn’t sound quite so tinny on this album, it does still sound smaller than the music really warranted. The other, less forgivable (but much smaller) problem is an extremely peculiar edit in the finale, “Happy Ending”, which sounds completely botched. It’s hard to imagine that something that truly was unintentional could make its way onto the album – but if that is intentional then it is very difficult to understand. (You will know what I mean as soon as you hear it.) Anyway – otherwise things are perfect. The songs are classic, the score is good – and it all flows so much better in film order as presented here rather than lumping the songs together at the start and the score at the end, as on the old album. Quite delightful. Along with “The Lion King,” the only Legacy Collection album I genuinely want. Although I have to say “The Great Mouse Detective” is a lot better Holmesian affair than Guy Ritchie’s. Superb review James, time to update to Legacy Collection! I saw you mentioned “The Little Mermaid” had three Academy Awards nominated songs; that isn’t right, it was “Beauty and the Beast”. “The Little Mermaid” nominated songs were “Kiss the Girl” and “Under the Sea” which as you said, it won the big prize. Best!